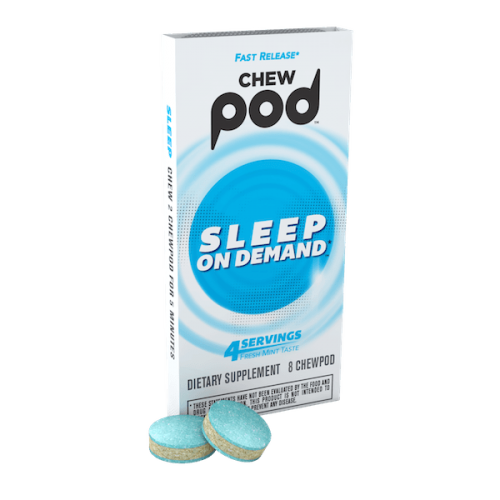 I have in my hands some samples of “Chew Pod”, in the two verison that exist: “Energy on demand” and “Sleep on demand”. Both are a very good example of tabletted gum (made from gum in pwoder by means of a tabletting machine). The gum pieces have 3 horizontal layers, I assume that they serve technological purposes (like minimizing the stickiness to the tabletting machine) rather than aesthetical ones. The crumbliness (quite common in these type of products) is minimized, or i would say, even non-existing. The flavor has a very good lasting. They come in blisterpacks wth 8 pieces each. The one that claims “Energy” contains Caffeine, Taurine and Guaraná seed extract (50mg, 50mg and 40mg respectively). The ones that claims “Sleep” contains Griffonia simplicifolia seed (5-HTP: 5-hydroxytryptophan) at 50mg per piece and 1,5 mg of Melatonin. Both versions contain vitamin B6 (pyridoxine HCl) and are sweetened with Sucralose. The company that produces them is headquartered in California, USA and the product is manufactured in Canada. You can learn more in a very attractive website: www.chewpod.com and also in www.khloros.ca (where I can see a thrid version of the product, named “Focus” but this does not seem to be in the market yet). You can also check the facebook page @chewpod and the instagram with the same label @chewpod , where this “Focus” version also appears. The company seems also open to produce for private label.